From comfort food to planning a potluck, chili hits the spot. 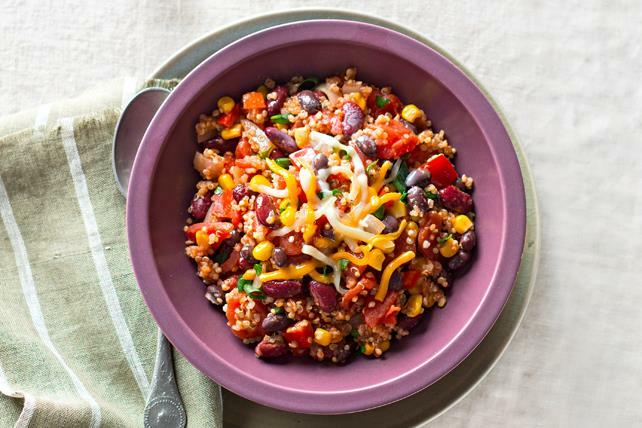 Quinoa boosts the protein in this spicy vegetarian chili. Prepare chili as directed, except do not add the green onions, cilantro or cheese; cool completely. Place in freezer container; freeze up to 1 month. When ready to serve, thaw in refrigerator overnight. Reheat before serving. Stir in green onions and cilantro. Serve topped with cheese. This delicious meatless chili can be part of a healthy eating plan. As a bonus, the black beans and kidney beans team up to provide a very high source of fibre per serving.